Charles Gordon’s thirst for danger ultimately led to his death in Khartoum at the hands of fanatical Mahdists. The epic struggle for Khartoum would be a fitting culmination to the career of one of the British Empire’s most celebrated warriors. Charles George Gordon was born January 28, 1833, in Woolwich, England. The town was, appropriately enough, home to the Royal Military Academy. His father, Henry Gordon, was an indefatigable career officer who had served in a variety of posts, risen to the rank of general, and fathered 11 children. The precocious younger Gordon seemed destined to continue the family’s military tradition. The Royal Military Academy accepted him at the age of 15. During his four years in the academy, he established a pattern of stubborn individuality that would later characterize his professional career. Gordon excelled in all of his studies and showed a particu- lar ability for fortification and cartography. His teachers and classmates came to know him as an introvert who disdained the niceties of military convention. After graduating in the summer of 1852, Gordon was commissioned in the Royal Engineers. His first duty station was in Wales, which was seen as an uneventful backwater assignment. Gordon made the most of it, though, and during his time in Wales underwent a watershed personal transformation. Previously disinterested in religious matters, the young lieutenant experienced a profound conversion to Christianity that would come to define him as a man and a soldier. From that point forward, he became a confirmed bachelor and decided stoic in his personal life. Gordon paired personal piety with a genuine aptitude for fighting. In December 1854, he shipped out for his baptism of fire in the Crimean War. In the Crimea, Gordon put his engineering skills to good use during the siege of Sevastopol, where he proved an industrious junior officer with a knack for leading from the front. Serving in the trenches for weeks at a time, Gordon stayed on the lines after being wounded and earned a reputation for marked composure under fire. After the war, Gordon pulled key staff assignments, one to Bessarabia and another to Armenia. Gordon came away from the experience with an insatiable addiction to cigarettes, which was the only vice he seems to have allowed himself, and a visceral repugnance for slavery. A flourishing black market that targeted Russian peasants for sale to Turkish elites thoroughly outraged Gordon, and he was further frustrated when his superiors seemed disinterested in addressing the problem. He quickly garnered a reputation as an effective subordinate; however, Gordon could be quite nettlesome, and he was more than willing to protest or disobey orders if he found them unjustified. Gordon was given command of the Ever Victorious Army in China during the Taiping Rebellion. A devout Christian, he ultimately resigned his post in disgust over unnecessary bloodshed. He volunteered in 1860 for duty more to his liking. At the time, China was convulsed by the Taiping Rebellion. Great Britain, which was hoping to contain the spread of the rebellion, had formed an uneasy alliance with the Xianfeng emperor. Newly promoted to the rank of captain, Gordon received permission to transfer to China. Assuming command of an engineering outfit, he joined the British occupation of Peking in the autumn of 1860 and then spent a year and a half on garrison duty in Tientsin. Captain Gordon initially had little to do, and he worried that he had arrived in China too late for the fighting. His fears would prove unfounded. Gordon joined a relief column that reinforced besieged British troops in Shanghai. Afterward, he put his engineering skills to work scouting rebel defenses at Tsingpu. His skills as a talented and energetic junior officer garnered the attention of his superiors, and they bestowed upon him an independent command in the form of an unlikely armed rabble with the pretentious title of the Ever Victorious Army. The force initially had been financed as a private mercenary army by Shanghai merchants rattled by the Taipings. The emperor eventually folded the force into his own army, and when there was a vacancy in the command of the Ever Victorious Army, English authorities lobbied hard for the appointment of a Briton to the post. For Sir Charles Stavely, overall commander of British forces in China, there was only one choice for the assignment. Largely at Stavely’s insistence, Gordon received command of the Ever Victorious Army in March 1863. At that point, he had 3,000 men under his command. Gordon occupied the curious position of a Westerner in the emperor’s army. Although he was officially under Chinese control, Gordon was largely granted operational leeway to fight on his own hook. However, he had strict orders not to operate outside a 30-mile radius of Shanghai. Still, he would function free of the regular Chinese chain of command and report directly to Li Hongzhang, the governor of Kiangsu Province. The unassuming Briton immediately impressed the Chinese governor. “He is superior in manner and bearing to any of the foreigners I have come into contact with and does not show outwardly that conceit which makes most of them repugnant in my sight,” wrote Hongzhang. Commissioned a general in the Imperial Chinese forces, Gordon went right to work. He immediately conducted a personal reconnaissance of the terrain around Shanghai. For that task, Gordon assembled a motley collection of Chinese, British, and American mercenaries who were notorious for unmilitary behavior. Gordon, who had a reputation as a tough but fair disciplinarian, cracked down on looting, issued new uniforms, and conducted regular drills. He placed a heavy emphasis on intelligence gathering, use of local assets, and meticulous planning. The ultimate prize was the city of Soochow, a Taiping stronghold on the Yangtze River. It was an objective that Gordon, who was an enthusiastic advocate of combined arms doctrine, planned to reduce with a heavy reliance on gunboats. Gordon’s flotilla, which was led by the paddle-wheeled flagship Hyson, afforded him startling mobility and a hard-hitting artillery platform. Gordon blooded his troops in Taitsan, where his Ever Victorious Army went into action in support of Imperial forces. Gordon personally directed three attacks on the town, which fell amid bloody fighting. “It really was a tremendous fight, and I never hope to see another like it,” wrote Gordon. In the bloody contest with the Taipings, such hopes would go unfulfilled. Gordon moved his troops toward Quinsan, which was then under siege by Imperial forces. Under somewhat vacuous leadership, they were getting nowhere. The Imperial commander suggested an all-out frontal attack on the city walls. Gordon demurred, though, recommending instead an amphibious operation that would slip behind the city and cut off its lines of supply. Governor Hongzhang, who arrived at the front to exercise nominal supervision, sided with Gordon. By the end of May 1863, Gordon was on the move in the Hyson. Using China’s interlaced network of canals as ready-made avenues of attack, Gordon confused Quinsan’s defenders by landing ground troops behind the city and bombarding rebel defenses with a 32-pounder on the Hyson’s gun deck. At the beginning of June, the city fell after heavy fighting. Although Gordon lost a mere handful of men, the Taipings were not so fortunate. They lost 5,000 men to Gordon’s troops and angry peasants. The bloodbath horrified Gordon, but the Chinese governor was delighted with the spirited officer whose planning had made the lopsided victory possible. “What a sight for tired eyes and elixir for a heavy heart it is to see this splendid Englishman fight!” wrote Hongzhang. In the campaign for Soochow, Gordon hoped to avoid costly frontal attacks. He concentrated on maneuvering his forces so that he could encircle the city and take it by siege. When negotiations for a capitulation went awry, he resorted to combat. Gordon’s forces lost 300 killed during a failed attack on November 28, 1863. In early December, Taiping leader Lar Wang, whom Gordon had come to respect, agreed to surrender his starving garrison. Fearing another bloodbath, Gordon ordered his own troops out of the area, leaving the city instead to Imperial forces. But just as Gordon had feared, the occupation of the city soon degenerated into outright slaughter. Amid the confusion, the British commander was captured and narrowly escaped death; however, the rebel leaders were not as fortunate. Gordon believed that Lar Wang, who was among the slain, had been “foully murdered.” In the aftermath of the bloodshed, an enraged Gordon threatened to arrest his superior, Governor Hongzhang, who he believed was responsible for the killings. Once back in Quinsan, an outraged Gordon was exasperated with the dirty work of suppressing the Taipings and resigned his command of the Ever Victorious Army. Chinese authorities frantically scrambled to retain his services. They offered him rebel battle flags, money, and personal pleas from the emperor, but Gordon would not change his mind. In February 1864, Gordon agreed to return to his command because he had finally become convinced that the governor had simply reacted to Taiping treachery at Soochow. In the final offensive against the Taiping capital of Nanking, Gordon’s troops retook the key towns of Yesing and Lyang, disrupting enemy communications. At Changchow, Gordon laid out a network of siege works preparatory to an assault. When Imperial forces launched an abortive attack on May 11, Gordon personally launched a counterattack that punched through the rebel defenses and captured the city. Such exploits served as a fitting capstone for Gordon’s service in China. When Nanking fell in July 1864, the honor of reducing the city was reserved for Imperial forces. 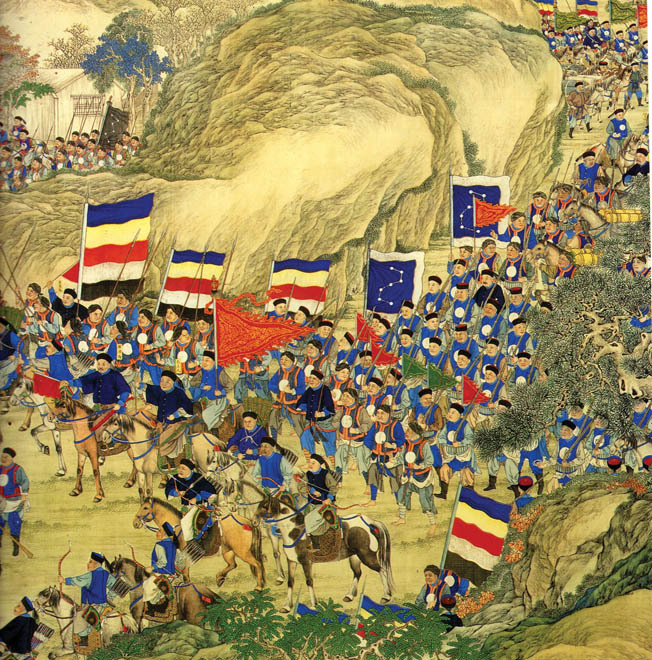 The Qing dynasty denied Gordon and the Ever Victorious Army the honor of participating. In many respects, the decision worked out for the best for Gordon and his troops. The fall of the city, which led to wholesale executions, mass suicides, and rampant bloodshed, resulted in the death of thousands of Chinese. The suppression of the Taiping Rebellion, in which Gordon’s generalship had proved so crucial, led to considerable personal honors. Lionized as a military genius in the British press, Gordon was brevetted a lieutenant colonel in the British Army, knighted a Companion of the Bath, and made a Ti-Tu, the highest rank in the Chinese Army. His admirers also gave him the colorful nom de guerre “Chinese Gordon,” which would follow him the rest of his life. Not one to rest on his laurels, Gordon chafed under the tedium of peacetime assignments in England and Eastern Europe. A chance meeting in Constantinople irrevocably altered his fate. Egyptian Prime Minister Nubar Pasha offered Gordon the governorship of the nation’s Equatorial Province. After obtaining a leave of absence from the British Army, Gordon accepted the offer. He was eager to apply his energies to the suppression of the African slave trade. On January 28, 1874, his 41st birthday, Gordon departed England. His plans for eradicating slavery did not involve outlawing the practice but rather choking it off by enforcing control of the water routes on which the trade depended, such as the Nile River, Lake Albert, and Lake Victoria. Gordon arrived at the provincial capital of Gondokoro in April and was soon plagued with myriad obstacles created for him by corrupt officials and inept conscripts. He constructed fortified stations throughout Buganda to cement the Egyptian Khedive’s claims to the region. Gordon succeeded in largely curtailing the slave trade on the Nile, but he was unable to stop the use of overland trade routes across Sudan. Physically exhausted after less than a year in the tropics, Gordon resigned in January 1877. But the Egyptians wanted Gordon’s continued assistance, so they offered him the governor-generalship of Sudan. Gordon accepted in the hope that such a position would enable him to more effectively combat the slave trade. Gordon instituted heavy taxes on slave owners and introduced a cumbersome registration system. He also took to the field with a force primarily composed of liberated slaves to directly confront the slave traders. Gordon’s greatest achievement was the capture of Suleiman Zubair, one of the most powerful of the African warlords. Although heavily outnumbered, Gordon cowed Zubair into surrender. He felt a degree of satisfaction at having pursued the slave dealers to their strongholds. “Even in these remote parts, a mere difference in color does not turn men into chattels, and life and liberty are sacred things,” wrote Gordon. Gordon left Sudan in July 1879. As usual, he found that he had little aptitude for any- thing less than active campaigning. Gordon took various positions in India, China, and the Cape Colony. The intensely devout Gordon spent much of 1883 in Palestine, musing on the precise location of Christ’s crucifixion and resurrection. For much of the time that Gordon spent in the Holy Land, his accomplishments in Equatorial Africa and the Sudan were threatened by religious zealotry of a far different stripe. The cities of Dara and El Obeid had fallen in January 1883 to the Mahdi, a self-proclaimed Muslim prophet named Muhammad Ahmad who was gathering increasing support across north-east Africa. At the head of a massive army of dedicated Ansar, the Mahdi was already in control of western Sudan. Such views would lead the government, with notable reluctance, to dispatch Gordon to the Sudanese capital of Khartoum. The new governor-general reached his post in Sudan in January 1884. His initial orders were to establish a new government. Afterward, he was to evacuate Khartoum’s large number of European and Egyptian nationals. But in a hasty conference in Cairo, his superiors granted Gordon wide discretionary authority to do what he thought was best. Such indecision and lack of coordination was a recipe for disaster. Gordon planned to reinstate tribal authority in Sudan. In so doing, he ironically would be empowering the very slave traders that he previously had fought so hard to undermine. He tried to buy off the Mahdi by offering the prophet the sultanship of Kordofan, but the Mahdi already had conquered the region. In the deadly struggle for the Sudan, Gordon had few options. The Mahdi grimly exploited the matter. Flush with repeated victories, his forces swelled as they moved north and east. With momentum clearly on its side, the Mahdi’s army fanned out across Sudan; in the process, it slowly established a cordon around Khartoum. Incapable of evacuating the city and unwilling to abandon the civilian populace, Gordon sat tight. Enemy forces cut the single telegraph line out of Khartoum on March 12, 1884. The residents of the city were left to their own devices. Gordon maintained hope that a British expeditionary force then operating in eastern Sudan would open an escape route through the city of Berber, but government officials refused to authorize such a move. 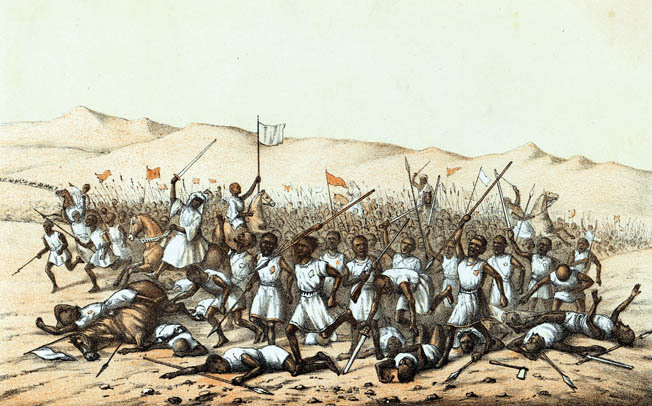 Berber fell to an Ansar attack on May 26, 1884, and thousands were massacred in the ensuing chaos. Prime Minister William Gladstone was not inclined to expand the British role in the Sudan and hesitant to dispatch a relief force, but an adoring British public clamored for Gordon’s rescue. Gladstone ultimately relented and ordered a relief column under the command of Sir Garnet Wolseley to march to Gordon’s aid. However, such double-minded strategic procrastination ultimately doomed the inhabitants of Khartoum. The beleaguered garrison held out for months. Rations ran short, and the desperate souls in Khartoum were reduced to eating donkeys, dogs, and rats. By the end of October, the Mahdi’s forces arrived at Khartoum and besieged the city. While the noose tightened, Wolseley’s relief expedition neared Khartoum. His forces clashed with the Mahdi’s Ansar in the Battle of Abu Klea, fought January 17, 1885. Wolseley defeated the Mahdists in the pitched battle. Four days later, British troops caught sight of Gordon’s Nile steamships. Wolseley was handed a dispatch from Gordon written in late December. It bore heartening news. “Khartoum all right; can hold out for years,” wrote Gordon. 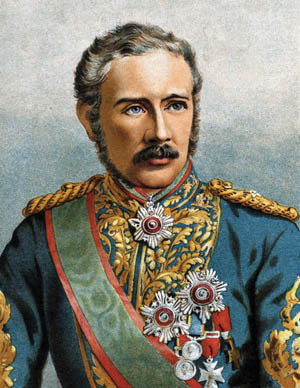 Sir Garnet Wolseley’s relief expedition defeated the Mahdist Sudanese army at Abu Klea in January 1885, but Wolseley failed to appreciate the urgent need to lift the siege of Khartoum. The result was the Mahdi’s brutal massacre of the garrison and 4,000 civilians. Such optimism was tragically misplaced. Rattled by the clash at Abu Klea, the Mahdi ordered an attack on Khartoum late on the evening of January 25. Taking advantage of low water in the Nile, the Ansar stormed across an exposed sandbar, taking the city from the rear while another force rushed the city gates. In a few hours of horrific night fighting, the heavily outnumbered garrison was overwhelmed and nearly all of the soldiers slain. In addition, the Mahdists massacred 4,000 Christian and Muslim civilians. Gordon, fighting furiously with a revolver, was killed and beheaded outside the governor’s palace according to survivor accounts. Tags Africa, American, Armenia, army, artillery, axe, Barding, Britain, British, British Army, British Empire, British Expeditionary Force, Cairo, Cape Colony, Cecil Rhodes, Charles George Gordon, China, CIA, Constantinople, Crimean War, danes, EAM, Eastern Europe, Egypt, elites, England, Europe, Garnet Wolseley, general, Great Britain, india, Joshua, Mahdi, military, Muhammad Ahmad, Muslim, Nanking, Ney, NSA, OSS, Palestine, POW, Qing dynasty, Queen Victoria, river, Royal Engineers, Russia, SAS, Sevastopol, Shanghai, Siege of Sevastopol, Soochow, Sudan, sword, taiping rebellion, Taipings, telegraph, Tern, Thor, Tientsin, Tory, Tula, turkish, US Army, William Gladstone, WIN, wounded, Yangtze River.